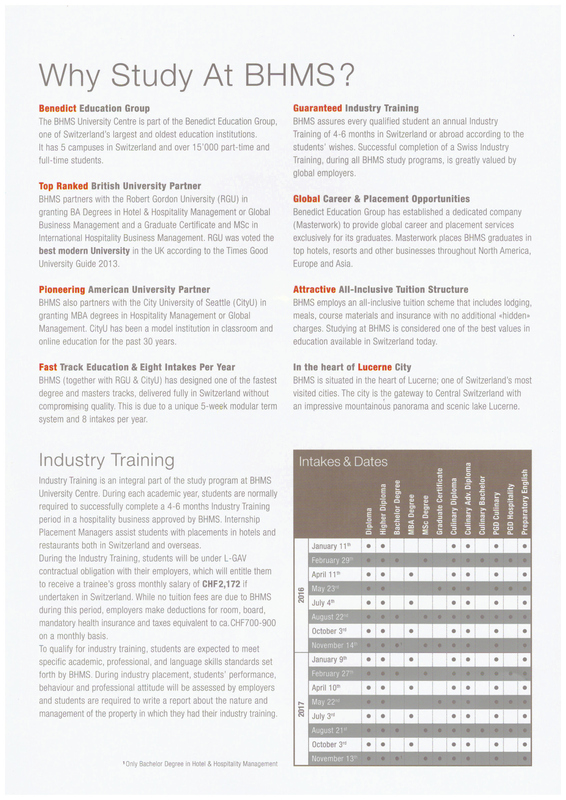 Establish in 1998 as part of the Benedict Education Group, one of Switzerland’s oldest and largest Higher Education Institutions, The Business and Hotel Managements School (BHMS) University Centre provides undergraduate, graduate and post graduate programs in the fields of Hotel and Hospitality Management, Culinary Arts, Global Business Management and MBA programme in Hospitality and Global Management. BHMS University Centre is located in the heart of Lucerne City and at the scenic heart of the Swiss Alps with its famous Pilatus Mountain. Lucerne is a truly international tourist destination and is the most visited city in Switzerland. In 2014, Lucerne was voted the region with the best quality of life. The BHMS University Centre has four campuses located in Lucerne City; Lakefront Centre, Utoring, Sentipark and Baselstrasse 57. Leading school in Hospitality. Job Placement into international company upon graduation. Why Business and Hotel Management School University? The University Centre has a partnership agreement with Robert Gordon University, Aberdeen (ranked as the Top Modern University in the UK by leading University Guides)to offer the B.A. Degree in Hotel & Hospitality Management and Global Business Management in Switzerland. 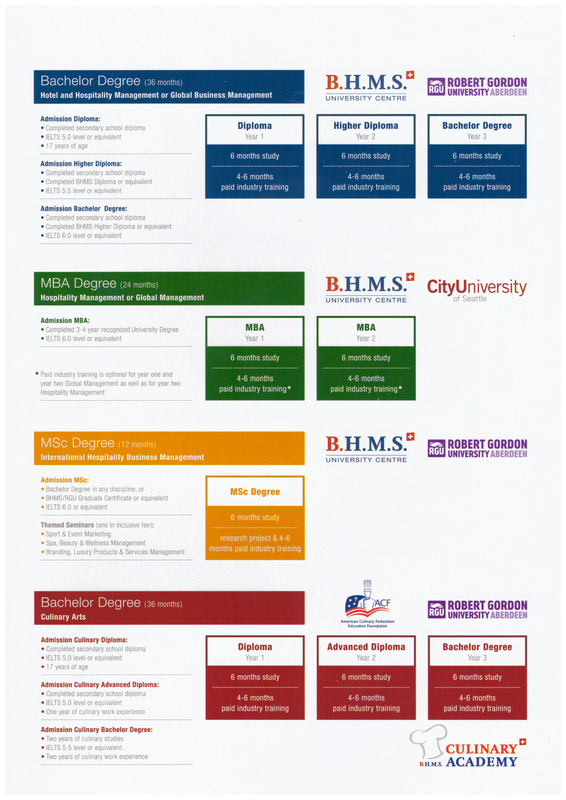 BHMS University Centre offers a fast track in achieving a B.A. Degree in 18 months of study plus 18 months of industry training. BHMS students gain an advantage of 6 months less study and 6 additional months of paid work experience as compared to other Swiss Hotel Management Schools. BHMS University Centre implements a unique system of education by dividing a 20-week semester into four mini-terms of 5 weeks each. This allows students to focus on only 4 to 5 academic subjects in one setting as compared to being overloaded with 8 to 10 subjects in other Swiss Hotel Management Schools. An Integral part of the study programme at BHMS University is industry training through internship. In ensuring students gain a hands-on experience, BHM students are obliged to undertake a 4-6 months internship period in a hotel or restaurant approved by BHMS during every academic year. In addition, A Career and Placement Counsellor assist students with placements in hotels and restaurants in Switzerland and abroad. BHMS University offers a 10-week University English Foundation Programme designed for hospitality, global or culinary management students whose English does not yet meet the entry requirement of the program. The English Foundation Programmes is a dynamic course involving active learning that promotes English listening, speaking, reading and writing skills. To ensure students maximise their development, the program is offered at three different levels.